[02:15:42] skd5aner: Just seeing this in the log with -v playback on mythfrontend: Decoder mythplayer.cpp:3319 (DecoderGetFrame) – Player(0): Decoder timed out waiting for free video buffers. [04:24:41] stichnot: skd5aner: make sure only one instance of the frontend and backend are running? Watch more verbose backend logs to see that the frontend is properly connecting? [04:25:12] stichnot: test a different playback profile, like Slim, just to be safe? [07:51:24] stuartm: skd5aner: there is a driver problem there – "OpenGL: OpenGL is using software rendering"
[10:22:23] bergqvistjl: Has the mythfilldatabase --update behaviour changed for 0.27? It now tries to update the channel icons with it's own suggestions, which before, using --update, never used to do that? [10:24:24] bergqvistjl: i've noticed when mythfilldatabase updates, it also removes the pathname in front of the channel icon file for each channel, which I dont think any of the themes support yet. [10:53:54] bergqvistjl: well in 0.26, using the --update argument would prevent mythfilldatabase from udpating icons, i can be sure of that. [10:54:39] bergqvistjl: is there any way to prevent mythfilldatabase updating my icons then, as it gives me the wrong icons half the time, and overrides what i choose in the channel icons page in mythtv-setup anyway. [11:02:54] bergqvistjl: ahh right, is that 0.27 only? [11:03:13] bergqvistjl: *is that for 0.27 then? [11:06:08] bergqvistjl: not sure which is the correct behaviour. [11:08:41] bergqvistjl: any chance it can be fixed before 0.27 goes from RC1 to release. [11:11:07] bergqvistjl: it would make more sense if there was a --ignore-icons option, that performed a bog-standard update i.e. overwriting modified guide data, yet didn't touch the icons at all. [11:12:11] stuartm: dekarl1: any input? [11:16:33] bergqvistjl: if we can get --update to not touch icons, for now, then that would temporarily fix the issue at least, but I see what your saying though, re. the behaviour and name of the argument. [11:23:36] stuartm: bergqvistjl: are you able to test a patch? [11:24:27] bergqvistjl: have you commited the patch? if that's the case, i can rebuild it all this evening and test it? [11:24:46] bergqvistjl: I just use the mythtv-git package in Arch's AUR, but set to 0.27-fixes. [11:25:14] bergqvistjl: I mean if i'm able to just rebuild mythfilldatabase, i should be able to do that now, but im not sure how, that's all. [11:29:04] bergqvistjl: Where can i get the patch? [11:30:05] bergqvistjl: where do i get that from, the unstable git repository? [11:31:15] bergqvistjl: is there any way i can just clone/pull mythfilldatabase code, without building the whole of mythtv again? [11:35:07] bergqvistjl: once ive cloned the code, is there a way to just build mythfilldatabase on its own? [11:36:40] bergqvistjl: well i'll give it a go. i'm DLing from here clone git://github.com/MythTV/mythtv.git will that include your patch already? [11:43:44] bergqvistjl: pushed to unstable? [11:48:34] bergqvistjl: give me a few mins to build. [11:51:57] jya: i had suspected a race / threading issue..
[11:53:26] jya: how many more of lawrence's patches are in the queue? [11:54:28] bergqvistjl: I shouldn't need to restart the backend or anythig should I? [11:54:48] bergqvistjl: i should just be able to run mythfilldatabase straight away? [12:01:48] jya: isn't iplayer a UK things only? [12:02:45] bergqvistjl: the name of that "iplayer" patch is wrong. [12:03:13] bergqvistjl: it should be a patch to enable "Connected TV on Freeview"
[12:09:09] stuartm: do you run "git update" before building? [12:09:48] stuartm: bergqvistjl: are you using xmltv or schedules direct? [12:10:37] stuartm: can you run with -v xmltv and pastebin the log? [12:17:57] bergqvistjl: whats the difference between git update, and git pull btw? [12:20:00] bergqvistjl: can i DL yet? [12:32:27] bergqvistjl: built. testing now. [13:34:50] skd5aner: stuartm: I'm not using opengl in my profile, so I'm not sure why it's throwing that error? [13:50:38] stuartm: oh, now that's interesting, the log in the ticket has "AFD: Stream #0, has id 0x1011 codec id H264, type Video, bitrate 0"
[13:50:42] stuartm: bitrate of zero? [13:51:27] skd5aner: so, maybe it's decoding them wrong? [13:53:34] skd5aner: FYI – I have to leave here in about 10 mins and will be gone for most of the day... anything I can provide you in the interim? [13:53:51] stuartm: skd5aner: do they play with mythffplay? [13:58:27] skd5aner: want me to try mythavtest? [14:01:37] skd5aner: so, mythffplay played back... mythavtest launched and is hung on "Please Wait..."
[14:31:03] stichnot: stuartm: I no longer see the crash when exiting Video Gallery playback of h.264 videos. [14:33:54] stichnot: I just noticed something weird about my Deleted recording group. It contains 124 recordings, almost all of which were deleted months ago – why are they still hanging around? [14:34:43] stuartm: they really, really didn't want to go? [14:44:22] bergqvistjl: Ever since I applied that commit (although its probably something before then), video playback no longer works. [14:44:42] bergqvistjl: regardless of what playback method i use (vdpau, opengl) etc. [14:46:13] stuartm: must be something recent then as you were previously using 0.27-fixes? [14:47:17] bergqvistjl: Aha! it works if I disable MHEG in the menus. [14:47:34] bergqvistjl: I know you've been having trouble with getting those MHEG patches to work. [14:57:43] bergqvistjl: which branch, fixes 0.27? [14:58:38] bergqvistjl: is it git clone though? [14:58:53] stuartm: only if you've deleted your existing copy? [14:59:35] stuartm: you should only need to clone once, after that you can switch branches just by using "git checkout fixes/0.27"
[15:03:11] bergqvistjl: *im sure it was that. [15:08:39] bergqvistjl: i presume the patches don't affect the backend at all? [15:15:29] bergqvistjl: does that help? [15:21:08] bergqvistjl: stuartm: Ive built that revision, and the problem isn't there, so it must be those patches then. [15:37:56] stuartm: bergqvistjl: ok, can we try 6768914a7 next ? [15:57:08] bergqvistjl: stuartm: next build? [16:04:03] bergqvistjl: how many builds do you have for me to try? [16:10:21] wagnerrp: theres a difference? [16:14:06] bergqvistjl: says "Disabling Audio" "Audio Player" "Aborting Reconfigure"
[16:20:34] stuartm: bergqvistjl: how are the connected apps accessed? [16:22:21] stuartm: not the mythtv epg though? [16:22:28] stuartm: an mheg one? [16:26:12] bergqvistjl: also, what build do you want me to upgrade to next? [16:26:53] bergqvistjl: I actually delete them myself. [16:26:56] bergqvistjl: Are you in the UK btw? [16:29:34] bergqvistjl: I just delete them cos i rarely if ever watch them. [16:33:48] bergqvistjl: i'm having to rely on youtube vids of people watching it on a regular tv and i still dont know what it should be. [16:35:44] bergqvistjl: performance of the app itself is a bit... dodgy, but that's all par for the course IMO. [16:36:12] bergqvistjl: to fix the aspect ratio problems? [16:45:12] stuartm: but first what's the output of --version again? [16:46:16] bergqvistjl: what did that build fix, out of interest? [16:47:10] stuartm: yeah, ironic no? [16:50:01] bergqvistjl: well those non-connected/mheg only streams (the ones for BBC3 and 4) always used to work, but were very dodgy. [16:50:07] bergqvistjl: they'd crash the frontend half the time. [16:53:06] jya: Wifi in the train... Cool... stuartm it may be easier to have him use git bisect. [16:54:19] jya: You're sure it works only a few days ago? [16:57:03] jya: stuartm: You're seeing the same playback issue? [16:58:03] bergqvistjl: and wiether i use VDPAU or OpenGL, it still has the same issue. [16:58:10] bergqvistjl: so its not any of those. [16:58:32] jya: GitHub doesn't open seems to timeout here.. Can't look at that commit. No idea what it's about... Could it be my changes to TFW ? [17:00:10] bergqvistjl: right that build is almost finished now. What should I expect? [17:00:40] bergqvistjl: all of it? [17:01:26] stuartm: knightr: strange, why isn't it affecting me? [17:01:37] bergqvistjl: Could be a freeview problem, if you're using freesat? [17:01:45] bergqvistjl: well right now we have 3 scenarios, playback of normal channels. MHEG only non-connected channels, and MHEG-only Connected channels, right? [17:03:03] bergqvistjl: as in, it's hanging at "Please wait" for every type of video. [17:03:17] knightr: stuartm, he didn't say much about his config, he does mention having an NVidia card so maybe he's using VDPAU (which you possibly don't), could that play a part? [17:04:37] bergqvistjl: is MHEG enabled in the settings jya? [17:05:51] jya: Anything using the qt web browser is borked on the mac, pressing a key as soon as its launched only result in a "beep"
[17:06:02] bergqvistjl: oh god, that QT web browser is a POS. [17:07:11] bergqvistjl: you don't say. [17:08:24] bergqvistjl: even when using either pepper or actual adobe flash. 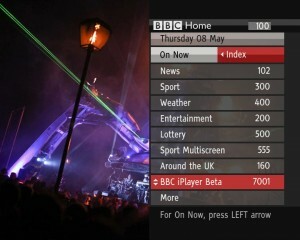 [17:10:11] bergqvistjl: would be better if someone built native plugins for iplayer, and stuff like that. [17:11:06] bergqvistjl: well if you're not in the UK, you wouldn't. [17:11:47] bergqvistjl: its funny, the stuff in the US that airs on BBC America, is actually produced and aired on the BBC's competitors here, ITV and Channel 4. [17:12:43] jya: So, how is that build going? [17:13:15] jya: You don't have ccache setup? [17:15:48] bergqvistjl: I will do next time. [17:16:25] bergqvistjl: so do i just install and thats it? [17:16:32] bergqvistjl: i dont need to run ccache by itself? [17:17:38] bergqvistjl: testing build now. [17:19:58] bergqvistjl: BBC1 red button is working! [17:20:04] bergqvistjl: oooh!!! it's a shiney new red button! [17:20:39] jya: What about playback? [17:23:37] bergqvistjl: its just white text on a black background, with the bbc3 (im on that channel now) logo. [17:25:16] bergqvistjl: appears to be a tad more responsive. [17:26:15] bergqvistjl: not sure if the MHEG remote buttons are working for CCTV though this time. [17:28:30] jya: bergqvistjl: So does normal video playback work? [17:29:47] bergqvistjl: but the red button is important, because it loaded a new red button app when I tried this build, where it didn't before. [17:30:41] bergqvistjl: I must admit though, overall all MHEG apps seem clunkier than before. [17:31:48] bergqvistjl: is there anything else you want me to try stuart? [17:33:14] bergqvistjl: the CCTV app seems to have less trouble with aspect ratios now. It's staying in 4:3 (like it should) all the time. [17:33:31] bergqvistjl: Oh no. No it's not. [17:34:43] bergqvistjl: do you have another build for me to try Sturart? [17:35:47] stuartm: bergqvistjl: can you "git checkout" then "git pull" ? [17:35:58] bergqvistjl: just a plain git checkout? [17:38:44] bergqvistjl: can't i just rm it and do a full git clone? [17:41:27] bergqvistjl: what will this do by the way, will this bring me up to date, but with that offending code change reverted? [17:47:23] stuartm: jya: just to be clear, you are referring to the revert commit? [17:51:27] bergqvistjl: ok, rebooting now. [17:52:23] jya: bergqvistjl: Why reboot? [17:53:52] bergqvistjl: between: fd308a75 and the current, is where the problem lies. [17:54:17] bergqvistjl: no need to pull? [17:55:47] bergqvistjl: I get: "error: Your local changes would be overwritten by revert. hint: Commit your changes or stash them to proceed. fatal: revert failed"
[17:55:59] bergqvistjl: checkout HEAD~ seems to work. [17:56:56] bergqvistjl: with the ea..... stuff? [17:57:13] bergqvistjl: or just git revert on its own? [17:58:08] bergqvistjl: says, my local changes will be overwritten by revert. [17:58:15] stuartm: jya: one of the local TV pundits remarked that "Abbott apparently has an Oxford eduction, but you may be wondering if that's really true when he manages to confuse the word repository with suppository"
[17:58:52] bergqvistjl: ok, so I do git reset, then git revert? [18:00:15] stuartm: the state one was 4 foot long? [18:00:57] bergqvistjl: youre getting out of my depth now. [18:04:15] bergqvistjl: "HEAD is now at 6e62a3c Player: Delete decoder after decoder thread stopped" is that OK? [18:04:18] bergqvistjl: is that the right point? [18:04:52] bergqvistjl: so i then build, stuart? [18:05:38] bergqvistjl: ah. i'm building now. [18:06:20] stuartm: oh right, need to "git revert ea77f4246"
[18:06:35] bergqvistjl: right, lets start again. [18:07:12] bergqvistjl: i have dinner now. I'll speak later. [18:13:28] stuartm: skd5aner: when you get back, could you try that branch too? [18:17:41] stuartm: knightr: since you're subscribed to that list (I'm not) can you advise them just to disable "Interactive TV" for now? [18:20:44] jya: Going to test here if I can reproduce the issue with interactive TV enabled... Where is that defined? [18:23:50] jya_: i looked at all of them earlier today, and nothing stroke me as incorrect. [18:27:18] bergqvistjl: right, where do I start? [18:28:28] jya_: I have a BBC recording here... stuartm how do I see if it has a mheg stream? [18:30:10] jya_: stichnot: why do the teletext subtitles look so different than plain teletext? they like 3 times as big ..
[18:30:41] bergqvistjl: the pull doesn't work. [18:30:53] bergqvistjl: says i'm not on a branch. [18:30:58] jya_: stuartm: would plain ffmpeg shows dsmcc_b stream? [18:32:22] bergqvistjl: ok, its building now. [18:34:23] jya: would there be one of the samples website? [18:38:51] bergqvistjl: building building building..
[18:39:02] bergqvistjl: ahh right jya. [18:39:12] stuartm: bergqvistjl: not fast enough! [18:39:33] bergqvistjl: by the way, BBC HD (on freeview at least) doesn't contain MHEG apparently. [18:40:15] stuartm: jya: oh, no dsmcc in that then? [18:40:38] bergqvistjl: ah ok. then it will do. [18:40:51] bergqvistjl: mheg should be built by default, i think. [18:41:15] bergqvistjl: btw stuartm, what should I expect re. the build i'm compiling now? [18:42:43] bergqvistjl: will it have those patches you mentioned earlier (which was authored by lawrence someone?)? [18:43:23] jya: but who is going to be willing to test ? [18:47:58] stuartm: I once made a detour, a very big detour, to meet up with a friend in Glasgow for a drink – arrived, with hours before my train home was due to leave and gave him a call – his response "Oh, was that today?? Sorry, but I've had to go into work and won't be able to meet up"
[18:51:34] bergqvistjl: that version OK? [18:55:23] stuartm: bergqvistjl: seems to be, what does it say for Branch? [19:01:05] stuartm: bergqvistjl: whereabouts in the UK are you? [19:03:02] bergqvistjl: MHEG is working, with the newer red button app. [19:04:24] stuartm: ok, good, assume videos are playing fine too? [19:04:58] bergqvistjl: MHEG is still very clunky in general when it comes to connected apps and BBC4 off air etc. [19:06:19] bergqvistjl: but yeah, it's working at least. [19:10:04] bergqvistjl: oh, have you fixed it in the main branch then? [19:10:20] bergqvistjl: yeah, I always use fixes. [19:12:44] bergqvistjl: whats the difference between master and fixes/0.27? [19:12:51] bergqvistjl: is master the unstable brance? [19:12:57] bergqvistjl: *unstable/bleeding edge branch? [19:24:11] bergqvistjl: anything major/notable on the cards for 0.28? [19:27:02] bergqvistjl: is mythbrowser going to be integrated as well? [19:27:18] bergqvistjl: given that plugins like NetVision depend on it? [19:36:01] knightr: stuartm, I didn't know you were going to work on the web setup. [19:37:00] knightr: I didn't post back about it on the ML but I still think it should be kept separate from the main backend process if it does become a replacement for MythWeb. [19:37:15] bergqvistjl: MHEG could be improved though, it's still very dodgy. [19:37:34] bergqvistjl: i mean it works, just not very well, stability-wise. [19:39:54] knightr: how? by directly accessing QTranslators? [19:42:35] knightr: You do know that doing that on the fly while still using them can causes crashes, right? [19:43:08] bergqvistjl: metadata could be improved IMO, for example, using the syndicated episode number to fill in the Series and Episode number, for XMLTV Radio times feeds at least. [19:43:25] bergqvistjl: because the metadatagrabber hardly works at all for me. [19:44:06] stuartm: knightr: have you got a reference? [19:44:57] knightr: pretty sure I saw that somewhere in their doc (not somebody else doc), just need to dig it up..
[19:45:34] bergqvistjl: it is reliable. [19:45:44] bergqvistjl: It's better than none anyway. [19:47:59] bergqvistjl: even if i include the series tvdb id in the recording rule. [19:49:22] knightr: stuartm, apparently working and working are two different things as you know..
[19:55:40] bergqvistjl: as long as it's as fast as mythweb today, then fine. [19:57:11] bergqvistjl: i ended up deleteing the binary file for it. [19:58:04] bergqvistjl: Anyway, mythweb does seem a bit... stagnant now. if i can change metadata artwork from within the webserver, and change things like a recording's episode and series number, then i'll be happy. [20:04:11] bergqvistjl: and tuning for channels as well, that is soo odd. [20:04:48] bergqvistjl: No, I like that. [20:06:19] bergqvistjl: you should just only need to change the channel name and number. [20:06:36] bergqvistjl: But yeah, 0.27 has simplified scheduling a lot, for the better. [20:12:53] bergqvistjl: Mythtv is still too complicated though. [20:12:54] bergqvistjl: I'd argue towards removing all analogue tuner support as well, but maybe that's a bit too radical lol. [20:12:55] bergqvistjl: you mean like the PVR-150? [20:12:56] bergqvistjl: i'd even remove support for the PVR-150 as well, but that might be more difficult, i mean i know the UK, Europe and US are digital only, but what about developing countries? [20:12:57] bergqvistjl: Yeah, but isn't that technically illegal Wagnerrp? [20:12:57] wagnerrp: why would it be illegal? [20:12:57] bergqvistjl: and anyway, most people could just record it through a HD-PVR, no? [20:12:57] stuartm: wagnerrp: though most people would want to do that with the HD-PVR, no? [20:12:57] bergqvistjl: In the UK, I believe it's against Virgin Media (UK national cable company)'s terms of service to do that. [20:14:29] bergqvistjl: Actually, not entirely. I believe virgin do run analogue services in some small areas, due to age-old contract issues re. who has the franchise. [20:15:31] bergqvistjl: if you get an honest poll, then you'll be able to see whether it's worth the hassle of dropping. [20:15:39] bergqvistjl: Well in Somerset, I cannot get a single virgin service. [20:15:47] bergqvistjl: No phone, no TV, no internet from them at all. [20:16:13] bergqvistjl: Where do you live? [20:16:25] bergqvistjl: I live in Wells. [20:16:50] bergqvistjl: I don't mind Sky, but I wish they wouldn't just block buy 90% of all US shows. [20:16:57] bergqvistjl: brb, changing usernames. [20:18:32] knightr: stuartm, thank you! [20:19:12] stuartm: wagnerrp: how many framegrabbers? [20:25:36] JohnBergqvist: Hi, i'm back. [20:28:11] jya: so any clue as to what is the mheg commit actually broke playback? [20:29:37] jya: JohnBergqvist: would you mind doing additional test? did you compile mythtv with --compile-type=debug ? [20:30:33] gigem: stichnot: If natanojl is right about the deadlock after resume, the patch at http://pastebin.com/td8mCP3a might help. FYI, it's not even compile tested and only half thought out. I'll have more time for it tomorrow. [20:30:51] JohnBergqvist: Do I have to? [20:31:05] dekarl1: stuartm, I think that for these cases it should simply be fixed upstream. I find it very sad that everybody invests lots of effort into one-off fixes but doesn't invest into fixing it where it is broken. [20:31:51] dblain: stuartm: let me know if/when you work on embedded mythweb. I was planing on looking at it and seeing what improvements would be needed in the http/services code to make it possible. [20:32:27] JohnBergqvist: I would prefer not to if that's OK.
[20:34:30] stuartm: dekarl1: no, still no wiser – this is about the --update discussion earlier? [20:39:38] JohnBergqvist: besides, I know Nick is (slowly) working on a way to migrate the RT XMLTV scripts to use Atlas's data, but seamlessly. [20:41:21] dekarl: but there are nice logo sets for AU,NL, you have some for UK. that can not be easily be used by MythTV/XBMC/A random TV Guide App. [20:42:43] JohnBergqvist: Well ive modified some of the lyngsat logos for my own use, because some of them are IMO not as good as they can be. [20:43:00] dekarl: your guide provider has offered to link to nice channel icon sets in their data feed, but as there is not definitive tv channel list on the internet its always going to be a one person job. [20:44:51] JohnBergqvist: I wish Nick would focus on Migrating GRAB_RT to Atlas IMO. [20:45:10] JohnBergqvist: cos the Radio Times XML feed is dying, if not dead pretty much. [20:45:40] JohnBergqvist: I know that the Atlas data in theory supports official fanart. At least for the BBC Programs. [20:46:03] JohnBergqvist: yes, but it does't include the new channels, like Drama and Movie Mix. [20:46:12] JohnBergqvist: and XMLTV is full depreciated now. [20:46:26] JohnBergqvist: Nick has been working on an Atlas XMLTV grabber for months now. [20:52:31] JohnBergqvist: yep, they stopped adding new channels a few months ago. Nick has had to do workarounds for BBC 2 HD. [20:53:19] JohnBergqvist: Hey, maybe someone could write a built-in atlas grabber for MythTV? [20:53:35] JohnBergqvist: that way you could handle metadata and everything then. [20:53:43] JohnBergqvist: that's a bit ambitious, I know. [21:06:20] dekarl: JohnBergqvist: embracing Atlas would involve merging Netvision / Recordings / Radio and more. But it would be nice to offer jump to VoD instead of programming a recording schedule if the program is available already/still. [21:06:42] JohnBergqvist: I'm not interested in VoD right now myself. [21:06:54] JohnBergqvist: I mean, iplayer in MythNetVision is a trainwreck. [21:07:25] JohnBergqvist: not that, i mean it crashes the frontend half the time. [21:08:00] JohnBergqvist: Well the BBC don't do a non-flash iplayer, do they? [21:08:07] JohnBergqvist: or if they do, NetVision, does't seem to support it. [21:08:09] stuartm: all the ones I've tried have had sub SD quality image, so why would I bother unless it was a last resort? [21:08:40] JohnBergqvist: Freeview does not offer an iplayer MHEG app. [21:09:39] JohnBergqvist: to get iplayer on mythtv, I need to use MythNetVision, which only works with the Flash iplayer, by simply opening a web browser at that URL. [22:49:46] wagnerrp: stuartm: you're more familiar with DVB-T tuning issues than i am... any opinion on where this page should go? [23:07:26] skd5aner: stuartm: ok, mostly caught up. I haven't updated yet, not sure if you're gone for the evening yet, would you like me to do a backtrace? [23:47:24] mattwj2002: anyone want to listen? [23:49:32] wagnerrp: is this a development question? [23:50:02] mattwj2002: thanks guys for all your hard work!